Mynisera was born in 3E 353, a noblewoman and daughter of Prince Klaius. She was wed to Lysandus, and was Queen of the Kingdom of Daggerfall during his reign as king, and their son, Gothryd, was born in 3E 381. The marriage may not have been ideal; it was rumored Mynisera was having an affair with Lord Bridwell, commander of the Knights of the Dragon, and it is known that Lysandus was secretly in love with the court sorceress, Medora Direnni. 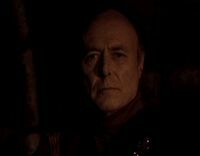 In 3E 401, Emperor Uriel Septim VII wrote a letter to Mynisera, saying that the Totem of Tiber Septim had been rediscovered in the Iliac Bay region. The bearer of the Totem would have the power to control Numidium, a colossal Dwemer construct once used by Tiber Septim to conquer all of Tamriel. The artifact was in the hands of a Lord Woodborne of Wayrest, a kingdom where the emperor had little influence. But Mynisera did, and he asked her to use that influence on his behalf, lest the artifact be used against the Empire. Mynisera never received the letter. In 3E 402, Daggerfall and Sentinel became embroiled in the War of Betony. Due to this, the Imperial courier was unable to deliver the Emperor's letter, and passed it off to a Knight of the Dragon for later delivery. 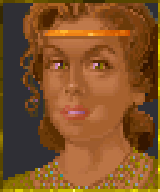 While King Lysandus was away fighting the war, Mynisera discovered proof of his affair with Medora and had the sorceress banished from the court. Medora retired to her ancestral castle on the aisle of Balfiera, the ancient Direnni Tower. However, the angry Mynisera placed a curse upon the sorceress, imprisoning her within the edifice. 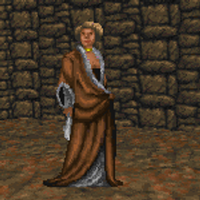 With his beloved Medora banished, Lysandus decided he would rather spend his life with her than return to Daggerfall. The king made plans to fake his death at the climactic Battle of Cryngaine Field, with the assistance of Gothryd and the Prince's ally from Wayrest, Lord Woodborne. But on the eve of the battle, Lord Woodborne assassinated the king. Gothryd was quickly crowned King of Daggerfall and led his armies to a decisive victory. As one of the terms of surrender, Gothryd was given the hand of Sentinel's Princess Aubk-i; Mynisera became the dowager queen. In time, The Emperor's letter was delivered, but as it was simply addressed to the "Queen of Daggerfall", it was delivered to Aubk-i. Before long, the letter was stolen by the Thieves Guild and sold to the Orc Warlord Gortwog gro-Nagorm. By 3E 405, the ghost of King Lysandus had begun haunting the City of Daggerfall, and the Emperor sent an agent of the Blades to investigate. This agent was also tasked with finding the missing letter, though the Emperor downplayed its significance, describing the contents as being of a "sentimental and personal nature". At some point, the agent's services were contracted by Queen Aubk-i, and involved Mynisera. The dowager queen was quietly paying to maintain a fortress in the countryside. On more than one occasion, Mynisera was seen leaving for this castle with mysterious parcels of papers, and later returning empty-handed. Aubk-i wondered what her mother-in-law was up to, and sent the agent to investigate. As it turned out, Mynisera was taking old letters and destroying them in secret. Most were Lysandus and Medora's love letters, as it seemed Mynisera was still devoted to her husband. However, there was one from Lysandus to Mynisera in which the king described the destruction of an Orcish village by Mynisera's father, Prince Klaius. Lysandus did nothing to stop the wholesale slaughter of the Orc children there, and the experience disturbed him greatly. The search for the Emperor's letter eventually led to a maid in Castle Daggerfall who witnessed Aubk-i receive and read the letter, then promise to deliver it to Mynisera. But according to the former queen, Aubk-i never did. Mynisera helped the agent track down the courier who delivered the letter, and the truth of the matter came out. Mynisera urged the agent to find the letter, and suggested Princess Morgiah of Wayrest knew more. Morgiah spoke of the letter's theft by the Thieves Guild and its sale to Gortwog. Mynisera wrote an appeal to the Orc Warlord for the letter's return, relying on her late husband's support of the Orcish cause to bolster her plea. Gortwog dismissed the flattery, but allowed the agent to retrieve the letter from the bowels of the steel fortress of Orsinium. Upon reading its contents, Mynisera grew concerned, surmising that Gortwog had likely sold copies of the letter to the major powers around the Iliac Bay. She urged the agent to find the Totem and turn it over to her friend, the Emperor, for safekeeping.